Another name for the beat in Reggae is 'One Drop'. In this beat, the strong beat is beat three, as opposed to beat one. The first beat is 'dropped'. Hence the term 'One Drop'. Here's a great example of a One Drop rhythm. Check out the nasty groove created by drummer Carlton "Carly" Barrett and bassist Aston "Family Man" Barrett on Bob Marley's "Trenchtown Rock" from Bob Marley Live! Bass: The bass is where the action is in reggae. Check out how the the bass line 'drops the one' on every measure except the last one. Amazing Bass, how sweet the sound indeed! 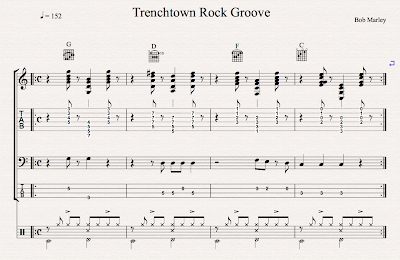 Guitarists: this is two rhythm parts compressed into one for a trio setting. Usually this guitar part would appear as two separate rhythm instrument parts. One instrument playing only the legato strong beat on beat three, the other playing the staccato 'back beat' on beats two and four. Also, take note of the voice leading in the upper voices of the guitar chords. It really makes the chord progression perk up.